Moisturizers with sun protection factor (SPF) provide less sun protection as compared to sunscreen of equivalent strength, in real-world scenarios, according to a new study presented at the Annual Meeting of the British Association of Dermatologists in Edinburgh. The findings also showed that the people are more likely to miss areas of their face while using moisturizers with SPF. Excessive or prolonged exposure to sunlight causes skin damage in the form of premature aging, increased risk of skin cancers and sunburn. For these reasons, there is a broad push to use SPF containing sprays or creams to protect us from this damage. Traditionally these sunscreens have been specially designed formulations, however, more recently, daily moisturizers, makeups and a variety of other skin care products have started to include sun protective elements. Despite the popularity of these products their effectiveness has not been rigorously tested. Kevin Hamill and Austin McCormick, researchers, Department of Eye and Vision Science, New University of Liverpool, assessed how effectively people apply sunscreen and SPF containing moisturizer to their face through the use of a specially modified camera that only sees UV light. 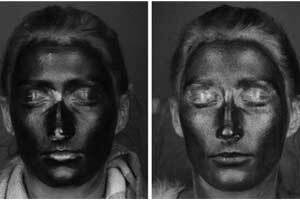 When an area of skin is successfully covered, the product absorbs the UV light and this area appears black in the photos – the lighter the area the less successful the absorption. 60 people (14 men and 46 women aged 18-57) were asked to apply sun protection, in the first visit SPF30 sunscreen, and in the second moisturizer with SPF30. Pictures were then taken with the modified camera to see how effectively people applied the two products. When applying moisturizer people missed 16 percent of their face on average, whereas when applying sunscreen this dropped to 11 percent. When just the high-risk eyelid areas were analyzed sunscreen users missed 14 percent compared with 21 percent with moisturizer. The eyelid area is a common site for skin cancers. The photos of people using the moisturizer are noticeably less dark on average, this indicates that the product is absorbing less UV light. On average men were significantly better at applying the products than women, other groups that proved better at it were people with darker skin tones and older participants. perceived ability to apply the products before and after viewing the images dropped from 90 percent positive to 42 percent, and moisturizer from 85 percent to 38 percent, indicating that participants were not aware of their failure to achieve adequate coverage. “One of the things I particularly enjoyed about this research is that it’s very visual and fairly easy for people to understand. The darker the image, the more sun protection people are getting, said McCormick. “We expected the moisturizer to perform worse than the sunscreen on overall protection, as it seemed intuitive that people apply moisturizer quite thinly on the whole. While we were correct in this, the research did throw up some unexpected surprises. We thought that people would miss more of their face with the sunscreen, as we’ve all had that stinging sensation when you accidentally rub some in your eye and we expected that this would lead people to be conservative and avoid the eyes. Actually, people missed more of their face when using the moisturizer. Matthew Gass of the British Association of Dermatologists said: “Unfortunately, moisturizer with SPF just doesn’t perform particularly well in real-world situations compared to sunscreen. Although it may say factor 30 on the box, this study is just further evidence that lab testing conditions for these products don’t reflect how they are used. “When products are tested for their SPF, they are tested at a density of 2 mg per cm². SPF used in moisturizers is tested the same way as sunscreens, so an SPF 15 moisturizer should provide an SPF of 15, however, as this study demonstrates, they are likely to be applied a lot more thinly than sunscreen, and less uniformly. Applying less SPF will reduce the protection to a higher degree than is proportionate – for example, only applying half the required amount can actually reduce the protection by as much as two-thirds.